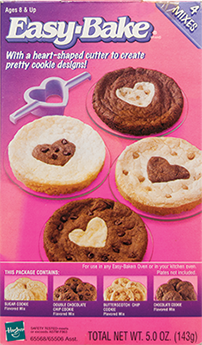 There’s good reason that the Easy-Bake Oven has remained popular for over 50 years. Right from the start, it did what every great toy does: it allowed kids to “play” at having an adult experience. And adults love it, too, for making a day-to-day experience more playful. The Easy-Bake Oven has stayed current with the times. It’s always reflected contemporary trends in colour, technology, and design. 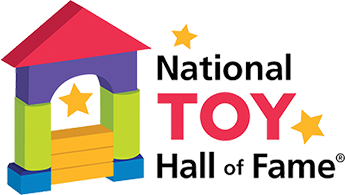 Look at the toy oven’s history and you’ll understand why it’s a National Toy Hall of Fame inductee. 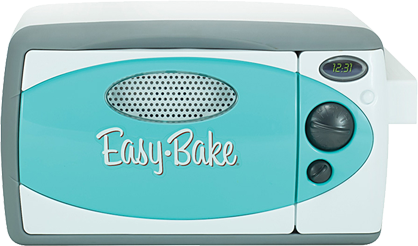 The Easy-Bake Oven hits store shelves in yellow and turquoise options. 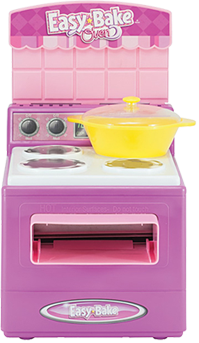 The first toy oven powered by a 100-Watt light bulb, it’s an instant hit for Kenner Products, and it sells out over the holiday season. 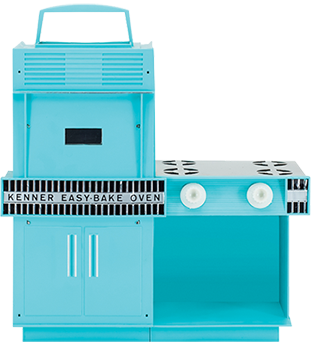 Based on the previous year’s sales, Kenner triples production of the Easy-Bake Oven. 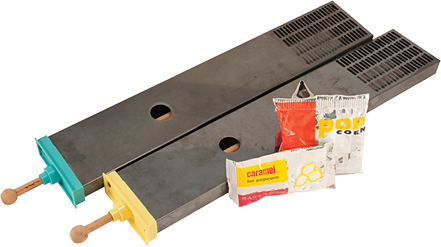 The Easy-Pop Corn Popper attachment is added to the line. 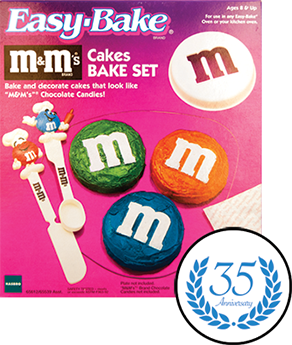 More than 1 million Easy-Bake Ovens and 20 million Easy-Bake mixes have been sold. Now, more than 2 million Easy-Bake Ovens and 28 million mixes have been sold. 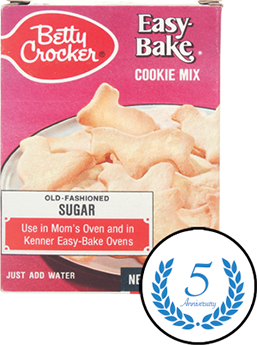 Betty Crocker mixes are now available for the Easy-Bake Oven, giving kids an even more realistic experience. More than 3 million ovens and 50 million mixes have been sold. 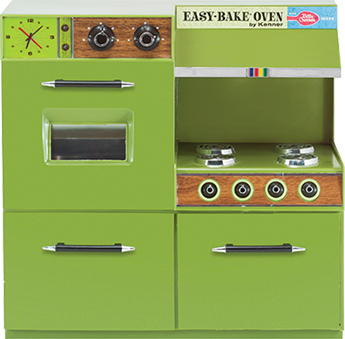 A Betty Crocker-branded oven model is released in red, turquoise, and avocado green, with faux-wood grain panels and storage cabinet. Now more than ever, kids can bake “just like Mom!” This version is powered by two 100W bulbs. Nearly 4 million ovens and more than 67 million mixes have been sold. 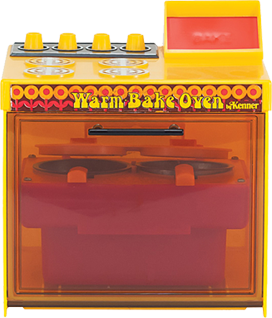 The Super-Easy-Bake Oven is introduced in classic 1970s Harvest Gold. Kenner ups the ante on this model with a working 20-minute timer and double-sized pans. It also includes a storage cabinet and fold-away range top. 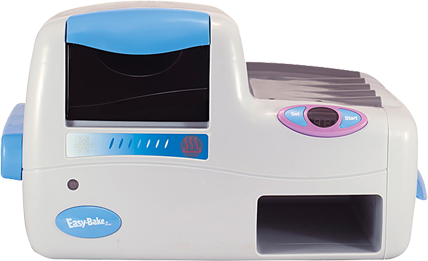 The Contemporary Easy-Bake Oven is introduced, reflecting changes in the design of its real-life counterpart. Offered in sunshine yellow, lime green, sky blue and burnt orange, the front is decorated with stylized flowers. This is the first toy oven to be powered by a single 60W bulb. More than 5 million Easy-Bake Ovens and 80 million mixes have been sold. 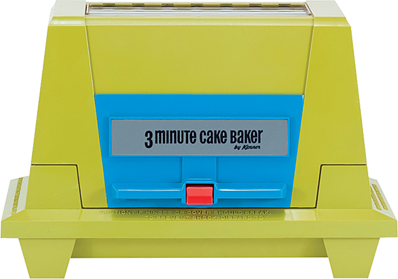 The 3 Minute Cake Baker is also introduced, aiming at a younger audience. 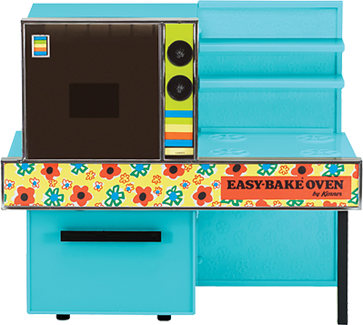 For the toy’s 10-year anniversary, Kenner re-brands the Easy Bake Oven as the Betty Crocker Easy-Bake Oven. It’s available in poppy red and lime green, and is decorated with labels in trendy plaid. 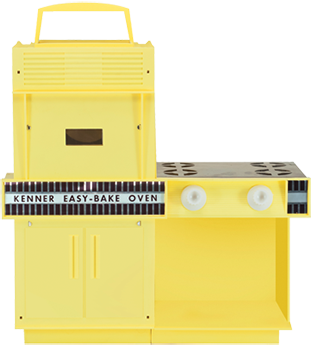 In its second bid to appeal to younger baker, Kenner introduces the Warm-Bake Oven. 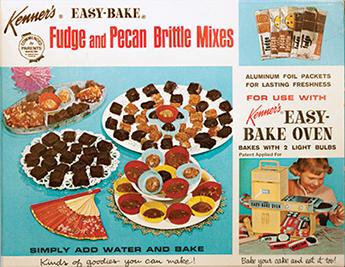 Using a special line of mixes, children could bake treats in metal pans immersed in hot water. 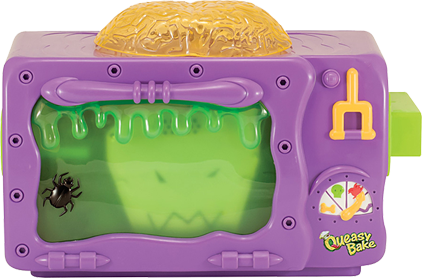 Keeping in step with new microwave technology, Kenner introduces the “Mini-Wave” model and celebrates the Easy-Bake Oven’s 15th anniversary. This oven’s inner workings are revamped and the enclosed baking chamber uses a single 100-Watt light bulb. 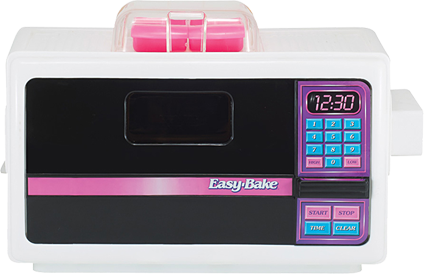 It’s the 20th anniversary of the Easy-Bake Oven, and Kenner rolls out a new model with two temperature options. Using a lever on the oven, kids can set the internal temperature to high or low. 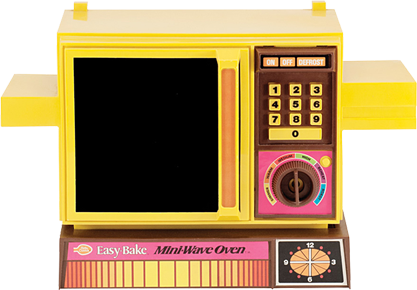 To celebrate the 30th anniversary of the Easy-Bake Oven, Kenner releases an all-new model by super-sizing the Mini-Wave concept into a more current design. 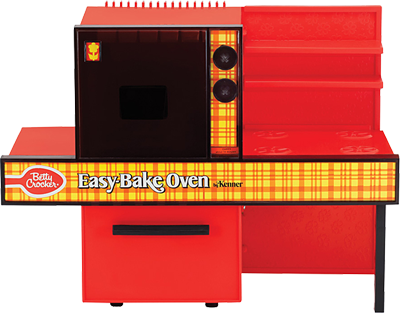 By now, more than 11 million Easy-Bake Ovens have been sold. The Easy-Bake Oven turns 35. More than 16 million Easy-Bake Ovens and 100 million baking sets have been sold. 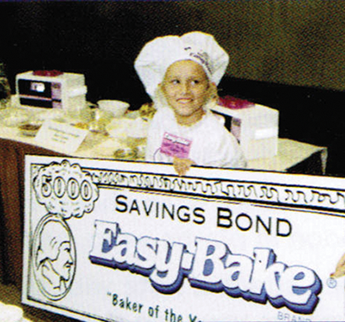 Hasbro (now owner of the former Kenner Parker Toys) holds the first Easy-Bake Oven Baker of the Year contest. More than 19 million ovens and 130 million mix refills have been sold. In a bid to tempt more boys to bake with toy ovens, Hasbro introduces the Queasy Bake Cookerator. The oven is tricked out with spiders, skulls, and bones. For the Easy-Bake Oven’s 40th anniversary, Hasbro releases the first model featuring a heating element instead of a light bulb as a heat source. 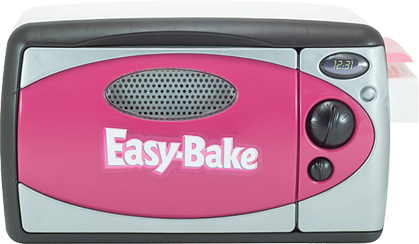 The new Easy-Bake Oven follows the deep-hued colour palettes trending in the fashion and automotive industries with the release of this black, silver, and magenta oven design. Hasbro releases the Easy-Bake Classic Oven an officially retires the light-bulb design, replacing it with a heating element. This new format resembles a contemporary kitchen range. 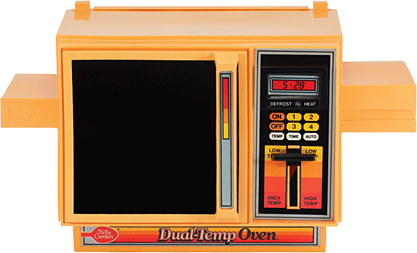 The Easy-Bake Oven is inducted into the National Toy Hall of Fame. More than 23 million ovens have now been sold. Hasbro returns to the traditional light-bulb baking design with the release of the Easy-Bake Oven & Snack Center – essentially a re-packaging of the 2004 model. On the eve of the Easy-Bake Oven’s 50th anniversary, the light bulb is once again replaced with a heating element. 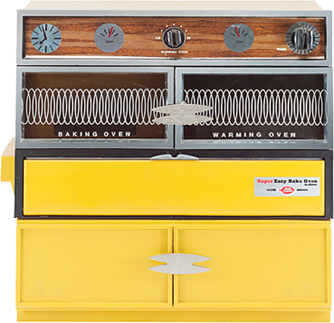 This design is radically retooled, modernized, and renamed the Easy-Bake Ultimate Oven. To commemorate the 50th anniversary of the Easy-Bake Oven, Hasbro releases a new color scheme. The design changes dovetail with an online petition, filed by 13-year old McKenna Pope, asking Hasbro to make a gender-neutral oven design. More than 30 million ovens and 150 million mix refills have been sold. The Baking Star Edition dresses up the Easy-Bake Ultimate Oven with a new white-with-sprinkles color scheme. National Easy-Bake Oven Day is founded, recognizing the enduring legacy of this iconic toy and its continued popularity among both children and adults.